1. Shrimp Ring – You can’t go wrong with this healthy app. There's no breading, no deep frying, no sugar = very reasonable on the cals. 2. 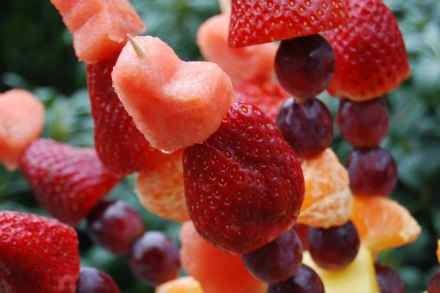 Fruit Kabobs - Serve with yogurt dip for dessert – a big hit with the little ones too. 3. Bean salsa – Combine one can of rinsed mixed beans with one can rinsed corn kernels, one chopped avocado and salsa as desired to glue the mixture together. Serve with baked tortillas for a yummy and healthy app. 4. Kettle Corn - Serve instead of chips or caramel corn. Pop corn kernels in a large pan with a bit of heated oil and a few teaspoons of sugar. 5. 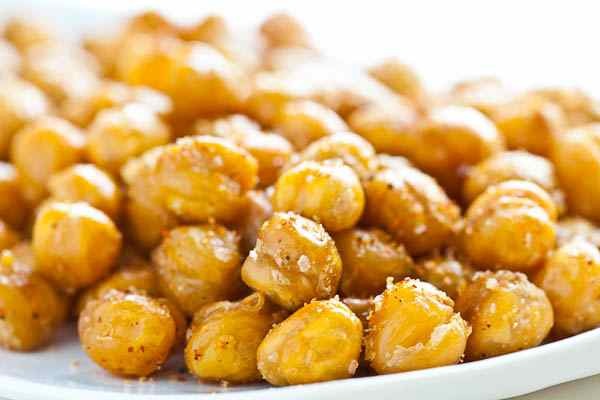 Roasted Chickpeas - This makes for a crunchy and healthy treat. Rinse chickpeas from the can, pat dry and add 2 tbsp oil and your choice of seasonings (i.e. garlic powder + chilli powder + cumin). Lay flat on a baking tray and bake until chickpeas are dry and crunchy. 6. Use Cucumber Slices - Instead of crackers as a base for apps like crab dip. 7. Pumpkin Hummus with Veggies – Hummus is so easy to make from scratch and will surely impress your guests! Blend the following ingredients in a food processor until taste and consistency is as desired: Chickpeas (rinsed from can) + tahini (aka sesame seed butter) + garlic + squeeze lemon juice + pumpkin puree (canned) + salt and pepper to taste. If it's too thick add a little olive oil to thin it out. 8. 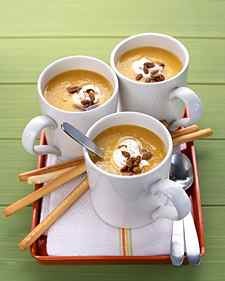 Butternut Squash Soup – Serve as an appetizer in mugs and it makes for a warm, healthy appetizer that people can sip on while mingling. 9. Grilled Chicken Kabobs with Peanut Sauce – Grilled chicken is high in protein and low in fat. Plus, who doesn’t like eating things off a stick? 10. Drink Tea - Offer your guests a selection of interesting herbal teas instead of the high fat/cal eggnog. Check out tea places like David’s Tea or Teopia for fun holiday blend teas. You can serve them hot or cold. See, healthy eating during the holidays CAN happen! Happy Holidays, from A and M! The GetRealGurls are dietitians backed by science and experience. 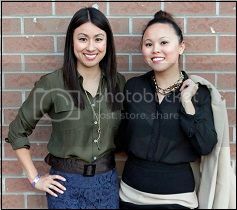 They share their honest thoughts and opinions about food, diet myths, and all things nutrition on their website: www.getrealgurlsnutrition.com. Follow them on Twitter @getrealgurls.